Wow. How do you review something like this? �United 93,� the movie, doesn�t feel so much like a movie. It feels like an event. With such sensitive material, I�m sure many people wonder if the filmmakers will be insensitive in their portrayal � or simply disrespectful. It wouldn�t have been hard for the filmmakers to make bad decisions: use Hollywood stars, over dramatize. Surprisingly, these filmmakers show a great deal of discipline, detail, apparent accuracy, and a point blank, gritty-truth almost-documentary style to tell the tale of September 11, 2001. Interestingly enough, the film opens from the perspective of the four hijackers of flight 93. But the perspective is often changing, from one airport controller deck to the next, to the military, to the passengers, to the cockpit. The events unravel slowly with a tension that needles. I wasn�t sure I could bare it. Be prepared to relive those horrible feelings of that sad day, now almost 5 years ago. These are powerful memories. It�s a powerful film. I�m left wondering how the film will impact the world politically. Will American Republicans rally over it saying �See, this is why we need to stay the course in Iraq?� Will Democrats say, �See, how inept our president is � he�s totally unavailable and slow to react.� Will Bin Laden show it to his band and as a document to his success? I say this, what ever happened with the 911 commission�s recommendations? Has this administration implemented them and if not � then why the hell not? On the whole, the film is acted, directed and shot just about the best it could have been. With these 2 small exceptions: I did not like the ending chord on the fade to black. I did not like the �Ahhing� voice sound in the credit sequence � reminiscent of horror films and/or cheap angel sample. I do think the film is respectful of those brave airborne innocents who stood up and fought in order to save the lives of so many others on the ground. May they inspire us to courageously and aggressively live our best lives. 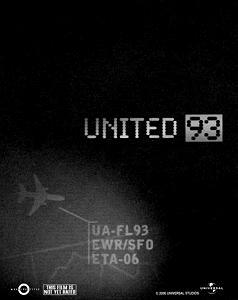 United 93. Copyright © 2006.